E’ possibile superare la gelosia? 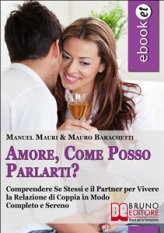 Lucio and Marta have been dating for about a year and so well together for 2 months they started to live together. Martha loves the attention that Lucio has for her and make her feel important, Lucio wants very well and feels that this feeling is reciprocated. Ever since they started to live together, however, are the first problems began: without there being a reason to pass suddenly intimate displays of affection in furious quarrels. Lucio feels misunderstood Marta is sad and confused .. The latest episode of jealousy is triggered during an aperitif between friends. Marta was talking with an old customer of the shop is laughing and joking with him than with other friends present, Lucius suddenly began to stir and fill it with insults and bad words. She tried to hide the sudden outburst in the eyes of friends, but then once back home he started to cry and get angry so he ends up arguing furiously. This is not an isolated fact, every time that Martha maintains a confidential relationship or mess with someone Lucio starts to get excited and filled with insults or suddenly and without explanation goes away leaving her alone. Working in hypnosis with Lucio emerge several episodes of his past unresolved where he is trusted by someone who loved only to be disappointed feeling teased by people who believed himself to trust. Because of these experiences he had removed and that have emerged in the sessions of hypnosis has never been able to have a stable relationship with a woman. Retracing his past every time a connection is made ​​more important than the fear of being taken around and laughed at him as they always did lead away and would not want to insult the people who loved to avoid losing them. How to solve the excessive jealousy? Following the initial hypnotic sessions Lucio was able to be calmer and better manage these shots of impulsivity that he had against Marta, he realized that these feelings of fear are not linked to what makes Marta but something in his past unresolved . He decided to get help with therapy because Marta loves and wants to go back to being free to love.